This drama outlines the various stories in which detective with strong personalities solve their ways through crimes with different investigative methods and know-hows. 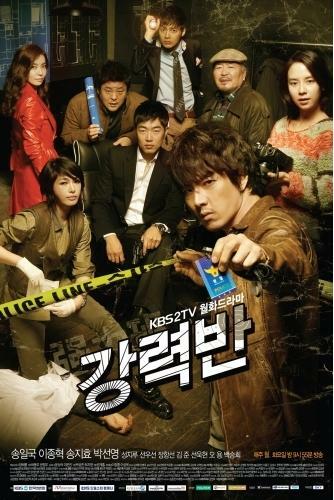 "Homicide" takes over the KBS2 Mon. & Tue. 21:55 time slot previously occupied by "Dream High" and followed by "Baby-faced Beauty" on May 2, 2011. Actor Kim Seung-Woo was initially cast as Jung -Il Do, but due to personal reasons dropped out of the series. In his place, Lee Jong-Hyuk took the role of Jung Il-Do. Actress Sun Woo-Sun dropped out of the series and her last appearance was in ep.7. Starting from ep. 9 actress Kim Sun-Kyung will takeover the role of Lim Kyeong-Eun. Al Dec 13 2017 5:28 am The acting of each cast is really good. The idea of the story is refreshing too. The romance exists but it's not being exaggerated. But, i have to tell weaknesses from this drama from my point of view. The first, the change between an event to another sometimes a bit sudden. Then, the drama dosen't emphasize on a certain point so i cannot decide which matter that i should focus. And last, the time sequence is not clear enough to tell the storyline of the drama. Despite all the weaknesses, this is my favourite criminal drama ?? Sora Jun 16 2015 2:30 am Song Il Gook and Song Ji Hyo had great chemistry with their budding relationship in this drama! The crime parts were a little slow, but I let it off since my two favourite actor and actress are in this drama together. Thats the main reason why I watched it anyway. Aj Aug 08 2014 11:23 pm Excellent cast, plot, and integrated stories with lots of wry humor, mystery, gentle romance, action, perfect closure. The leads who were also of course in Jumong have great chemistry. Highly recommended. wiksday May 03 2014 9:59 am I don't know that Song Il-Kook is 3 years older than Lee Jong-Hyuk. but in this drama Lee Jonng-Hyuk looks older than him. Vallery Dec 16 2013 12:01 pm Is it possible that Kim Young-Tae is played by Lee Yeong-Hoon? Quan Oct 19 2013 1:30 pm I rated this drama 100%. I like the personalities/roles of Song Il Guk and Song Ji Hyo here (plus the others in the main cast also). Despite that she calls him 'Ahjussi' still Park Se Hyuk and Jo Min Joo are right for each other, they're funny together, not sticky sweet to each other, each passionate of their respective jobs, supportive of each other, accepted as a close-buddy-pair by everyone around them, and so their 'romance' wasn't a source of 'stress' for me. Their bond, and the scenes where they are together, was a 'comfort zone' to me all throughout the drama, since the scenes have crimes for base stories. The crime-storylines cannot be underestimated also, especially the last case, on which I really gave my full attention to. I am relieved that Se Hyuk and his team are shown to be competent cops who sincerely care for people, and so for me this itself is the drama's statement, that evil intentions does not pay. Wow, the actors/actresses here are among the best, including those who played small parts. I salute Mr. Jang Hang-Seon (as Retired Team Leader Kwon) and Mr. Kim Kyu-Cheol (as Jo Sung Tae) for roles that are unforgettable to me. This is among the dramas I am never tired of watching repeatedly, the music is good, there's always something to laugh about, there are many very important life lessons to be picked up, though I do speed thru some gory scenes (! !ironically I learned a nice Korean phrase from one of them: "jal-hae-sseo-yo", meaning "Well done!") The bonding within Se Hyuk's workteam and the hilarity in Min Joo's workplace also endear this drama to me (thank you Shocking.com!) !Park Se Hyuk and Jo Min Joo! Aja! You're my favorite pair! Thank you 'Crime Squad'! Abyss Sep 03 2013 10:30 am I love this drama so so so much!! It's more intense and REAL than most overly cliche K-drama.. I love the relationship between Detective Park and Reporter Jo.. they're both so adorable :) I was hoping for them to be more romantic though :). Perfect ending would be they end up together and maybe do a 2 years epilogue or something where Min Joo will go to the station and let Sae-Hyuk knows she's pregnant or something.. that'll be so sweet~ and at least Sae Hyuk will have second chance at being happy and have a great family..
queenlala Aug 24 2013 3:19 pm i am fanatic any crime story but SORRY to say, this drama are unbelievable slow, boring and stressful. This is the worse plot crime drama i ever watch. No wonder the rating so low. Nad Nov 08 2012 4:19 am Just want to say , i very-2 like this drama. Don't miss it until now. Hope there will be a drama like this again. Hwaiting ! lara Oct 28 2012 3:59 am I really hope there is season 2 for this drama....there are lot of unfinished stories than can be continued. Especially for the lead characters Song Il Gook and Song Ji hyo...Crime Squad is great. I hope there is really a season 2! NewKDramaAddict Jan 09 2012 7:34 am I really like this drama! I am a lover of the unconventional. I was saddened that Sun Woo-Sun left! She was my favorite. Was not super crazy about the replacement. Jackie May 31 2011 4:20 pm this show is the smelly armpit of kdrama. it stinks. nida dela cruz May 09 2011 3:36 am i like the tandem of song il guk & song ji hyo, and all the other cast in the tv series, our family always watch the show every monday & tuesday here in Manila, i like both of them way back the movie jumong. they are funny and there is chemistry in their acting. i hope for the continues drama of detectives in trouble or the of the same theme. Judy Mar 22 2011 3:25 pm This drama seems cool and action . I really liked the first two episodes CUZ they were very interesting .